The Canyon County Sunrise Rotary Club has donated $1,250 to the Nampa Schools Foundation for a scholarship in memory of the late Vern Carpenter. The funds are dedicated to a scholarship for Nampa students who attend Northwest Nazarene University. Vern Carpenter passed away in October 2017. A man of the community who gave his service eagerly and willingly, Carpenter was a beloved member of Canyon County Sunrise Rotary Club. He was a graduate of Northwest Nazarene College and was an advocate for the benefits of education. 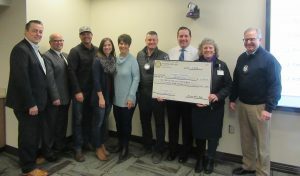 The donation was announced Jan. 25 at a meeting of the Canyon County Sunrise Rotary Club at St. Luke’s Nampa. Vern’s wife, Judy, sons Brent and Brad Carpenter, daughter Breanna Chud, and several members of the Nampa Schools Foundation attended the ceremony. During the presentation, club member Brett Tolmie extolled Vern’s contributions to the community. “Service Above Self is the motto of Rotary. For Vern, it was a way of life,” he said. The Nampa Schools Foundation seeks to increase patron support and raise funds to enrich the quality of education, expand learning opportunities for students and teachers, and bring the community together in support of the Nampa School District. The Canyon County Sunrise Rotary Club meets at 7 a.m. Thursdays in the Sunnyslope Room at St. Luke’s Nampa, 9850 W. St. Luke’s Drive. To learn more about the club, please see https://portal.clubrunner.ca/3859 or contact President JR Richardson at jrichardson@commercialtire.com. 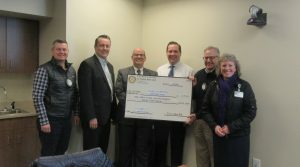 No Comments to "Local Rotary Club donates to Nampa Schools Foundation in honor of the late Vern Carpenter"